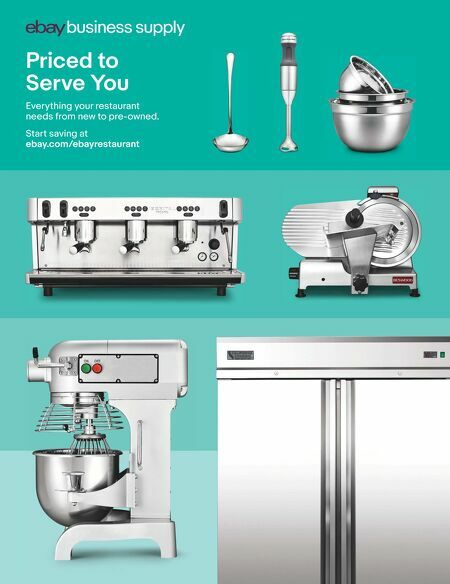 84 • FOODSERVICE EQUIPMENT & SUPPLIES • OCTOBER 2018 market spotlight [buy the products in a timely manner]. As a result, our shrink is incredibly low, less than half of the industry standard. This proves how our stores understand volumes, customer pat- terns and what sells." 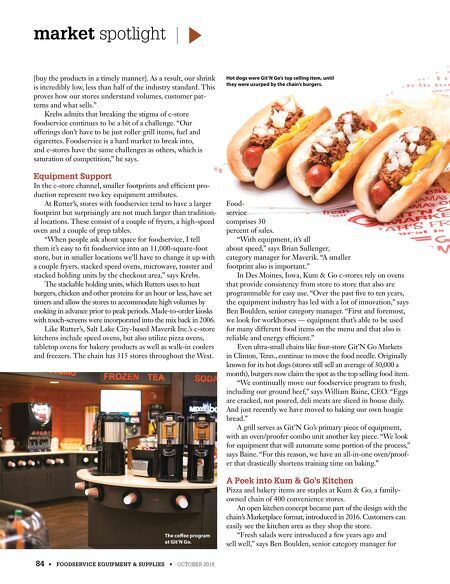 Krebs admits that breaking the stigma of c-store foodservice continues to be a bit of a challenge. "Our offerings don't have to be just roller grill items, fuel and cigarettes. Foodservice is a hard market to break into, and c-stores have the same challenges as others, which is saturation of competition," he says. Equipment Support In the c-store channel, smaller footprints and efficient pro- duction represent two key equipment attributes. At Rutter's, stores with foodservice tend to have a larger footprint but surprisingly are not much larger than tradition- al locations. These consist of a couple of fryers, a high-speed oven and a couple of prep tables. "When people ask about space for foodservice, I tell them it's easy to fit foodservice into an 11,000-square-foot store, but in smaller locations we'll have to change it up with a couple fryers, stacked speed ovens, microwave, toaster and stacked holding units by the checkout area," says Krebs. The stackable holding units, which Rutters uses to heat burgers, chicken and other proteins for an hour or less, have set timers and allow the stores to accommodate high volumes by cooking in advance prior to peak periods. Made-to-order kiosks with touch-screens were incorporated into the mix back in 2006. Like Rutter's, Salt Lake City-based Maverik Inc.'s c-store kitchens include speed ovens, but also utilize pizza ovens, tabletop ovens for bakery products as well as walk-in coolers and freezers. The chain has 315 stores throughout the West. Food- service comprises 30 percent of sales. "With equipment, it's all about speed," says Brian Sullenger, category manager for Maverik. "A smaller footprint also is important." In Des Moines, Iowa, Kum & Go c-stores rely on ovens that provide consistency from store to store that also are programmable for easy use. "Over the past five to ten years, the equipment industry has led with a lot of innovation," says Ben Boulden, senior category manager. "First and foremost, we look for workhorses — equipment that's able to be used for many different food items on the menu and that also is reliable and energy efficient." Even ultra-small chains like four-store Git'N Go Markets in Clinton, Tenn., continue to move the food needle. Originally known for its hot dogs (stores still sell an average of 30,000 a month), burgers now claim the spot as the top selling food item. "We continually move our foodservice program to fresh, including our ground beef," says William Baine, CEO. "Eggs are cracked, not poured, deli meats are sliced in house daily. And just recently we have moved to baking our own hoagie bread." A grill serves as Git'N Go's primary piece of equipment, with an oven/proofer combo unit another key piece. "We look for equipment that will automate some portion of the process," says Baine. "For this reason, we have an all-in-one oven/proof- er that drastically shortens training time on baking." A Peek into Kum & Go's Kitchen Pizza and bakery items are staples at Kum & Go, a family- owned chain of 400 convenience stores. An open kitchen concept became part of the design with the chain's Marketplace format, introduced in 2016. Customers can easily see the kitchen area as they shop the store. "Fresh salads were introduced a few years ago and sell well," says Ben Boulden, senior category manager for The coffee program at Git'N Go. Hot dogs were Git'N Go's top selling item, until they were usurped by the chain's burgers.